After decades of applying the theory that economic development in downtown Hamilton depends on making it easy to drive, the verdict is in. 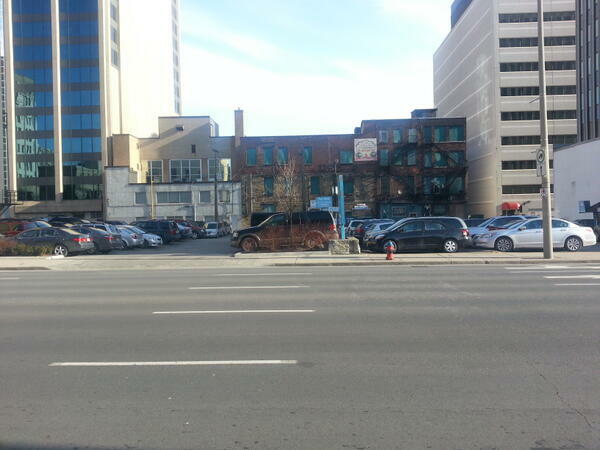 The theory is that economic development in downtown Hamilton depends on making it easy to drive. Councillor Terry Whitehead made it again today in an opinion piece for RTH in which he wrote, "Our strategic plan is to create a greater residential and employment density in the downtown. Many of these functions will rely on easy and accessible transportation for employees to attend work from outside of the downtown core." This theory is an instance of the more general theory that if the downtown is to be successful, it should behave as much as possible like a suburb. In Hamilton, we've been living with the application of this theory for decades. We converted our lower city streets into paired one-way, multi-lane thoroughfares to make it as easy as possible for large volumes of motorists to drive quickly through the existing Victorian street grid. We demolished whole blocks of intact urban streetwalls to make blank slates onto which we dropped suburban-style malls and other mega-projects, complete with rooftop plazas and elevated walkways - all to keep people away from the streets, which we had already turned into de facto expressways. We demolished more blocks of intact streetwalls to make room for surface parking lots so all those drivers would have somewhere to put their car when they drove downtown. We made the streets so ugly, scary and threatening to pedestrians that people no longer felt comfortable to get out and walk around, which is the primary way of moving in a downtown. We destroyed so many buildings that there were no longer very many destinations worth going to. We ruined so many streetwalls with block-busting demolitions that sidewalks now feel dangerously exposed instead of comfortably framed. The "urban renewal" monstrosities we added in the 1960s-80s are products of a time when people held the public realm in contempt and designed buildings to look like fortresses. The lower city continues to vastly underperform its potential at generating economic activity, including property tax assessments to finance the operation of the city. The city as a whole continues to underperform its population growth estimates, year after year after year. It turns out we cannot build suburban sprawl fast enough to make up for the lost potential of our urban centre to accommodate more people more productively. Meanwhile, the city's overall lifecycle debt obligations continue to worsen as we build more sprawl without charging enough in development charges and property taxes to pay for them. In other words, our ongoing effort to attact economic development downtown by making it easy to drive has been an abject, catastrophic failure. Last week, in a cheeky rant, I wrote that no councillor, in 2013, has an excuse not to understand how cities actually work. Density - a higher number of people per unit of area. With more people in a given area, per-capita infrastructure costs go down. More interesting, the rate of innovation and economic development by a variety of measures actually goes up. Mixed use - a variety of different uses in close proximity. Mixed use multiplies the benefits of density by bringing lots of different destinations within close reach. Walkable streets - streets that are safe, comfortable and inviting to walk on, making destinations easy to reach. Walkable streets have sidewalks that are wide enough for interaction, intact streetwalls with a mix of different street-level uses, a canopy of street trees, and physical protection from automobile traffic. High quality transit - For trips that are too long to walk comfortably, it should be fast, convenient and affordable to choose public transit instead of having to drive everywhere. Combined together, these urban development principles produce what has come to be understood as the essential economies of cities: economies of scale, agglomeration, density, association and extension. Each urban economy contributes to the economic development of the city: scale divides fixed costs among larger markets, agglomeration clusters talent and resources and raises productivity, density reduces transportation and infrastructure costs, association makes collaborating and innovation possible, and extension allows urban businesses to expand into new markets and cities to share innovations. These economies are why cities are the engines of economic innovation and development: why they produce new ideas and businesses and industries and create jobs and generate the wealth that pays for the urban - and particularly the suburban - infrastructure we have come to expect. When suburban councillors demand that we sacrifice density, mixed use, walkable streets and high quality transit for the false panacea of easy driving, they are really asking the city to kill the golden goose that makes their chosen lifestyle possible. Hamilton has no future as a glorified bedroom community. We need to activate our own urban centre to be an economic driver for the whole city. As Indianapolis Mayor William Hudnut famously said, "You can't be a suburb of nothing." IF the status quo conditions are so great, why do we keep having conversations about renewing the city? Beyond the status quo issue, this is one of those cases where there are false dualisms at play. It's either drive or not drive. Choosing both is not an option. It's either urban or suburban interests, not both. No one is saying that everyone in the city should live downtown in a dense urban environment. If residents on the mountain like their suburban environment, fine. Why not make the city work for a variety of people, not just a select few? Providing options creates diversity, increases resilience, etc etc ad nauseum. Mixed use... you mean like a Michael's, Best Buy and a Walmart all in one easily drivable complex... right? Thank God for Terry Whitehead's logic. Rare at RTH I know. He should run for Mayor!